Six Organs of Admittance - "The Sun Awakens"
Ben Chasny has been a busy fellow, not only with his own band, but also with his adopted band Comets on Fire. His efforts have helped to create two of the best albums of 2006, one from CoF, the other, the latest from Chasny's solo project, Six Organs of Admittance. The Sun Awakens is a brilliant journey into what might best be described as space folk, not quite along the lines of the other freak folk players he's often been compared to because The Sun Awakens rocks at times too, and you'd be hard pressed to call the 24-minute magnum opus that closes the album as folk music. More on that shortly! Torn By Wolves gets things going, a brief instrumental with gentle, almost jazzy guitar, underscored by very subtle atmospherics. At under 2-minutes, it's barely a taste of what's to come. Bless Your Blood is a slowly building, reverb-drenched thing of beauty. Gentle acoustic guitars strum over spacey electric ruminations as soft piano notes fall like raindrops from a dark sky. When Chasny's vocals start, it's a bit shocking, but unlike some of the vocal tracks on his other albums, it really works here. The higher pitched harmony vocals are truly haunting, combined with fellow CoF member Noel Von Harmonson on loose, organic sounding drums and John Connell on Persian ney, a sort of flute like instrument, it all builds to a slowly drifting spacescape of noise and melody. Black Wall is an awesome acoustic rocker, with some fantastic guitar work, both on the picked acoustic guitar that drives the piece, and the freakier electric guitar that slices through it like a barely controlled conflagration, burning the song from its core for a truly edgy turn. The instrumental The Desert is a Circle seems to take a bit of its inspiration from those old Ennio Morricone spaghetti western soundtracks. Evocative acoustic guitar is layered with haunting psychedelic flourishes on a heavily tremoloed electric guitar. When a wordless vocal from Chasny enters two thirds of the way through the piece, it sends shivers up your spine. The intense, psychedelic folk brew of Attar follows, another instrumental with some deeply primitive and beautifully organic drumming from Von Harmonson again, and more scorching, spaced out electric guitar from Chasny. A brief acoustic reprise of the opening cut, this one called Wolves' Pup sets things up for the final track on the album. Clocking in at just under 24-minutes, River of Transfiguration is one of the most transcendental, mind-blowing pieces of music I have ever heard. If you're looking for a rocking jam, however, this is not the place to come. This is one mesmerizing slow burn. Using tone generators, bass, gongs, Persian ney, and organ, Chasney and his band create a deeply complex, swirling drone that builds ever so slowly for over 6 minutes before Harmonson's nearly freeform drumming and Chasney's very exploratory electric guitar enters the piece. But things slowly coalesce as the composition takes shape with spacey, spiritual chants; distant, unfocused, dream-like soundscapes; churning, rumbling swells of shimmering and sometimes nearly symphonic noise; and those drums that just take off all over the place. Simply breathtaking! The Sun Awakens is my pick for best album of 2006. 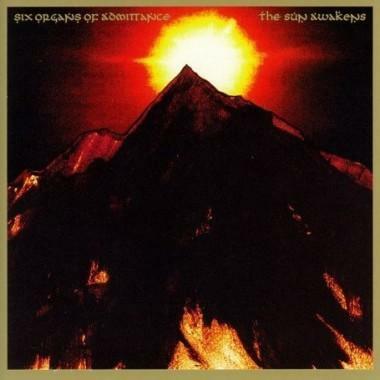 For more info you can visit The Six Organs of Admittance web site at: http://www.sixorgans.com/.